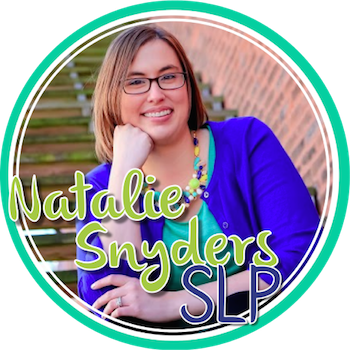 There’s just something about fall that I love – the leaves changing colors, the beautiful trees, and the crispness in the air… but it also tends to be a busy season for me in the schools! This year, I’ve already had meetings on over a third of my caseload within about two months, plus parent teacher conferences, initial evaluations, you name it! 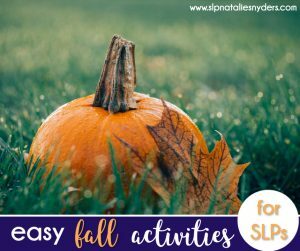 So while I love fall, and love to incorporate it into my sessions when I can, I’m definitely looking for low prep ideas. So, here’s what I am using in my therapy room in the next couple of weeks! 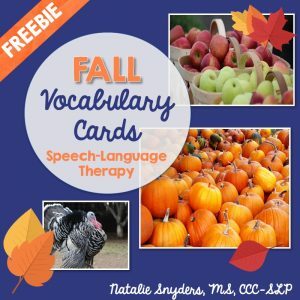 Fall picture vocabulary cards: These free cards are easy to print and pull off the shelf as needed! I use them with a wide variety of my caseload to work on yes/no questions, labeling, WH questions, stating functions/associations, similarities/differences, descriptions, complete sentences, fluency, articulation, and phonology. Even better: I can use them over multiple sessions! 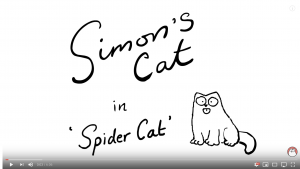 Simon’s Cat Videos: My friend Felice at The Dabbling Speechie introduced me to the Simon’s Cat videos, and I love them! There’s a series called “Spider Cat” that is perfect for Halloween. I like to use these in therapy to work on predicting, inferencing, sequencing, story retell, past tense verbs, and WH questions. First, we watch at least part of the video, and then talk about what happened. The humor level is right on for my elementary students, too! 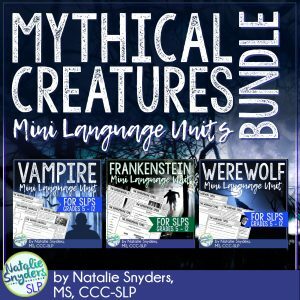 Mythical Creatures Mini Unit: This set of mini language units on vampires, werewolves, and Frankenstein has been a hit with my upper elementary and middle school students! Each set has a two page article to read together, then a set of corresponding activities that target articulation, comparing/contrasting, describing, multiple meaning words, irregular past tense verbs, conjunctions, comprehension, and vocabulary. Directed drawings: I have a few students working on following directions, and a great way to target this is to work on directed drawings! I give the students a piece of paper and some crayons, and give them directions (example: “Draw a small black circle in the middle of the page.”). 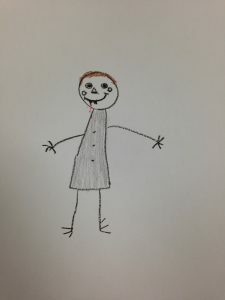 I generally choose something the student will be able to identify when the picture is complete (such as a pumpkin or a vampire, as in this example). These can be as simple or complex as you would like! 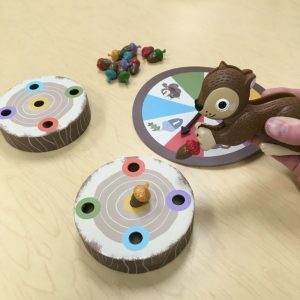 Sneaky Snacky Squirrel: This is one of my students’ favorite games! It’s a terrific open ended game for up to four players, and great for mixed groups. Simply have your student take a turn saying his/her word five times, providing an antonym, identifying a category name, etc., then they can take a turn at the game. 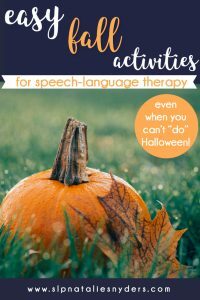 What are your favorite low prep fall activities to do in speech-language therapy? Drop a comment below and let me know! 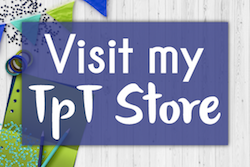 PS: Want more ideas delivered directly to your inbox? 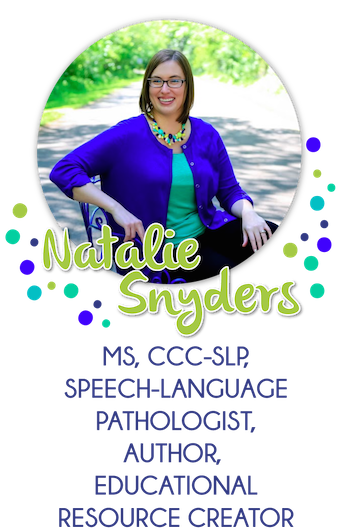 Sign up for my email newsletter at www.bit.ly/NatalieSnydersNewsletter! Thank you so much for your great ideas and materials! Thanks so much for these great ideas!! !